Our searchable database has over 500 cookers reviewed and rated by the world's leading authority on the subject, the world's only full time grill and smoker tester, Max Good. Many have comments from owners. Pay attention to our Best Value Awards. We think these are the best of the best on the market in a wide range of prices. Don't see what you want? Use the search box on the left on large and medium screens, and below on smartphones. You should also read the articles linked below for shopping tips. There are six heat sources for cooking outdoors: Hardwood logs, hardwood pellets, hardwood lump charcoal, charcoal briquets, gas, and electric. Each produces a different flavor, and each has its strengths and weaknesses. 1) Hardwood logs are the way it all started. Cooking with logs is tricky and requires the right kind of cooker, the right kind of wood, and lots of practice. Controlling temperature is tricky. For grilling logs are especially problematic since wood flares up a lot and burns very hot. Most stick burners, as they like to call themselves, start the wood burning outside the cooker, let it burn down to glowing embers, and then they cook with the embers. 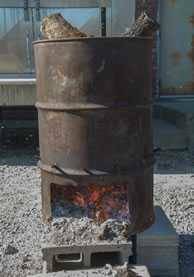 Above is a classic "burn box" made from a 55 gallon drum for preparing embers. If you don't get it right, you'll waste a lot of food. It is easy to burn your meal and easier to make it taste like an ashtray full of cigarette butts. Most backyard cooking devices cannot burn logs. But there are some big rigs that do. You never want to burn softwood or resinous wood like pine because the sap burns very hot and the flavors are not very tasty. Some are hazardous. I do not recommend burning logs unless you are an experienced pitmaster. How to Grill With Wood and Master Campfire Cooking. Here is an article on the What You Need to Know About Wood, Smoke, And Combustion and the different kinds of smoke. 2) Hardwood pellets, on the other hand hardwood pellets are about the easiest method going. The newfangled cookers that use them are modern marvels with digital thermostat controllers. Pellets are sawdust that is compressed into little rabbit pellet sized chunks no thicker than a pencil each less than 1/2" long. The pellets are fed into a burn pot and ignited. The number of pellets and the oxygen supply are regulated by a digital controller. Some of the better controllers are accurate to within 5°F, and that's more accurate than most indoor ovens. The better pellet burners are literally "set it and forget it". They are best at indirect heat smoking since most do not do direct heat grilling at all, and the few that do, don't do it well. I have never seen one that gives a proper sear to a steak. Almost all of them are designed so there is a metal plate between the burn box and the food, so they are indirect cookers out the door of the factory, like an indoor oven. But when it comes to smoking, they are superlative. And the food tastes beautiful, although some owners complain that it is not as smoky as they like it. On the down side, they give everything a smoke flavor, and sometimes you just don't want it. As counterintuitive as this seems, the subtle smoke flavor is because the wood combusts so thoroughly and efficiently. Click here for more about pellet grills and smokers as well as a buyer's guide. 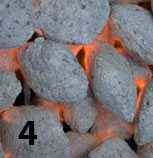 3) Lump charcoal or (4) charcoal briquets. Charcoal is made by an ancient process of partially burning hardwood until it carbonizes forming char, which is a highly efficient fuel source. Charcoal can burn practically smokeless, but it usually produces flavorful smoke, and it is capable of very high searing temps. It is especially good for steaks. It takes longer to get up to cooking temp than gas or pellets, and there is ash to be disposed of so setup and cleanup are slightly more labor intensive than other fuels. I highly recommend charcoal, especially in combination with smoke producing hardwood chips, chunks, and pellets. 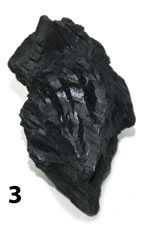 There are two basic types of charcoal, lump or briquets. To learn more about the production process of both briquets and lump, read my article on the Science of Charcoal. Click here for a buyers guide to charcoal grills, and here for a buyer's guide to charcoal smokers. Click here for an article on setting up a charcoal grill. 5) Gas comes in two forms, bottles of liquid propane, and piped in natural gas. The flavor is identical. Gas grills and smokers are extremely easy to use and produce good flavor, especially when combined with hardwood chips, chunks, or pellets. Gas grills are the most popular because they fire right up and require little cleanup. For more about how gas grills work, their strengths and weaknesses, read my article on gas grill setup. Click here for our overview of gas grills, and here for our take on gas smokers. 6) Electric grills and smokers use a heating element that glows as electricity passes through it, sort of like a giant light bulb. The glowing element generates heat that cooks the meat. Because there is no burning, there is no cellulose, lignin, char, or even oxygen combusted, there are no combustion gases. There is no smoke, and so there is no smoke flavor. The great advantage is that electric heat is very easy to control, and because there is no fire, it is allowed on most apartment balconies that forbid other grills. You can use sawdust and wood chips with some electric grills, and get a nice smoke flavor, but it is different from other smoke flavors because the wood smolders at a low temp. Electric smokers can make smoke from wood, but the burn temp is so low that the flavor is very different than gas or charcoal smokers, and in my mind, inferior for most foods. Nor do electric grills get hot enough to properly sear a steak without overcooking the interior, and most cannot be configured in a 2-zone setup. I recommend electric grills and smokers only for people in buildings where gas and charcoal are not allowed. Charcoal grills vs. gas grills. Let's settle this once and for all. How to buy a grill. A checklist of things to look for before you buy. Take it shopping. How to buy a smoker. A checklist of things to look for before you buy. Take it shopping. Charcoal grills. Still the best way to sear a steak. There are some designs that work better than others. Here's what you want. Gas grills. Nothing beats gas for convenience and versatility. And yes, you can smoke on them. Here's what to look for. Electric grills. Really just glorified electric frying pans, better than nothing if you have a small condo balcony and they won't let you have a charcoal or gas grill. Charcoal and wood smokers. Tip top flavors, some are super easy to use, and others are a pain. We'll tell which are which. Egg, ceramic, and other kamado-style grill/smokers. Heavily insulated, these are very efficient smokers, exscellent at pizzas and baking, low and slow roasting, and cold weather cooking. Pellet grill/smokers. Thermostat control that is truly set it and forget it, and you're cooking with wood. Amazing tools, but not good for searing. Gas Smokers: Buying Guide, Reviews, Ratings, and Recommendations. No messy charcoal, steady temps, very good flavor, and cheap. Electric smokers. Set it and forget it. But the flavor is lacking. Stovetop smokers. Smoke indoors (if you have a good vent fan) or on camping trips. Small portable grills. For the balcony, beach, boat, and tailgating. Pig, lamb, goat roasters. For the party animal in you. Large capacity, trailers, and commercial smokers. Ready to start catering, open a restaurant, cooking in competitions, or county fairs? Pizza ovens. For the best pizzas, rustic breads, and more. Stainless steel. Is stainless a good choice? Designing an outdoor kitchen. How to plan an outdoor living space, and hidden gotchas. Parts to repair, modify, and upgrade your cooker. Revive the old warhorse. Grills gone wild. Need a laugh? Thermometer guide. Cooking without good digital thermometers is like driving at night without headlights. Dial thermometers are technology from the 1800s and they are often waaaay off. Don't be making excuses for overcooked meat, or apologies in the hospital. Best BBQ accessories & gadgets. Here are the cool tools and toys that will make you a better outdoor cook. Required kitchen accessories & gadgets. What every kitchen needs. Grill grates. What's best, what's worst. And it's not cast iron. Grate cleaning tools. The best way to get rid of the gunk. Charcoal starters. One method is best, one method is worst, the others, meh. Our favorite regional BBQ sauces. There are so many great sauces. Here are some that we think represent the style of their region. Cookbooks, books, and mags. Our favorite reading. Tunes for barbecue. Make your own mix tape of barbecue, food, and drink music. 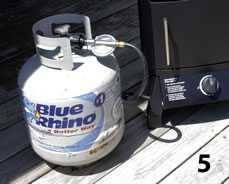 Extension cords for pellet smokers, electric smokers, and electric grills. Let's not start a fire. Aprons, T-shirts, more. Fun things to wear and more. Injectors. Quit brining, start injecting. Bar necessities. What you need to serve drinks in style. All about corkscrews. They do not have to be torture devices.